Will the changes APRA have made to lending force you to deleverage your portfolio? This is a question investors should be considering, as lending changes may make it unsustainable for some highly leveraged borrowers to continue holding their existing property portfolio. These borrowers may be forced to sell their existing property portfolios and reduce their debt exposure. A couple years ago, APRA tightened the servicing requirements lenders use to assess loans, reducing the amount of money investors can borrow. More recently, they asked lenders to reduce their exposure to interest only lending & have made it more difficult for borrowers to retain existing interest only repayment arrangements. The combined impact of these changes is that some borrowers are now overleveraged, having portfolios that would not have been possible to acquire under these stricter rules. These borrowers may face a repayment increase over time & thereby be forced to reduce their debt. The purpose of this post is to educate readers on how forced deleveraging may happen,put a spotlight on who may be forced to sell& provide insight on what to do to prepare for this. For those that are impacted, having the time to prepare and adjust their portfolios and/or increase their buffers may be important to managing the risks associated with being overleveraged. Most property investors have their investments secured under the following debt repayment arrangements; a5-year interest only term to begin with (up to 10 years for some borrowers), followed by a 25 year principle & interest repayment period. This means at the end of the 5 year interest only period, the loan contract is set up to have a ‘repayment increase’ to repay the principle debt borrowed. In addition to a change in repayment type, it is prudent for investors to have a buffer for potential RBA cash rate increases. APRA have named the potential for this cash flow issue as ‘payment shock’. How big is the impact of a swap to P&I repayments & rate rises? How much interest rates change over time. The term remaining on your debt (is it 25 or 20 years). If you combine a few interest rate rises AND the need for your principle payments, you have the makings of a cash flow nightmare. This could force borrowers to sell their investments. The LHS shows the annual increase in repayment when an Interest Only portfolio at 4.75% swaps over to P&I repayments at 4.75%. The RHS shows the impact of a swap to P&I and a 1.50% increase in interest rates. Payment shock impacts property investors as they usually have more debt on interest only terms. Who will specifically be impacted will depend on the level of household debt you have relative to your income. 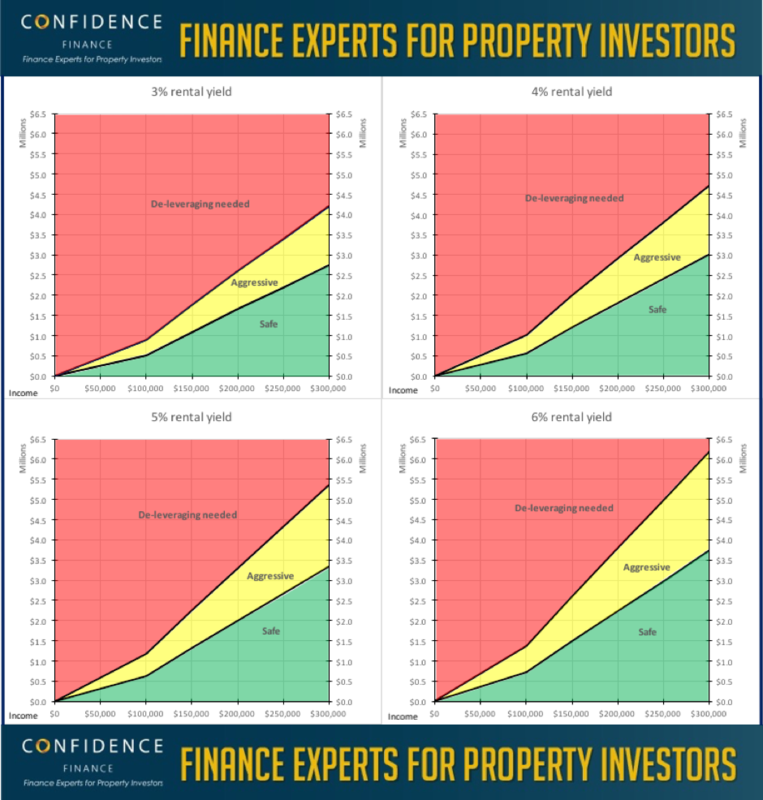 At Confidence Finance, we have modelled out a guideline of ‘safe’, ‘risky’ and ‘dangerous’ portfolio sizes based on different income sizes. This analysis is based on a couple earning a 50/50 split of total income, renting at $400 per week withlender calculated minimum living expenses, an interest only portfolio at 4.5% that is 100% debt funded. Will I be able to extend my interest only period? APRA changes to lending criteria mean that it will be harder for some borrowers to extend interest only terms via refinances or adjustments to their loans. Specifically, APRA guidance tells lenders to re-assess borrowing capacity for those seeking to extend their interest only periods. This means, if borrowers have a healthy level of debt relative to their income, they are unlikely to be affected by this payment shock. For reference, we have modelled out what a healthy portfolio size is based on different income and yield profiles. The ‘green’ is healthy and represents borrowers who should have no issues maintaining interest only borrowings. 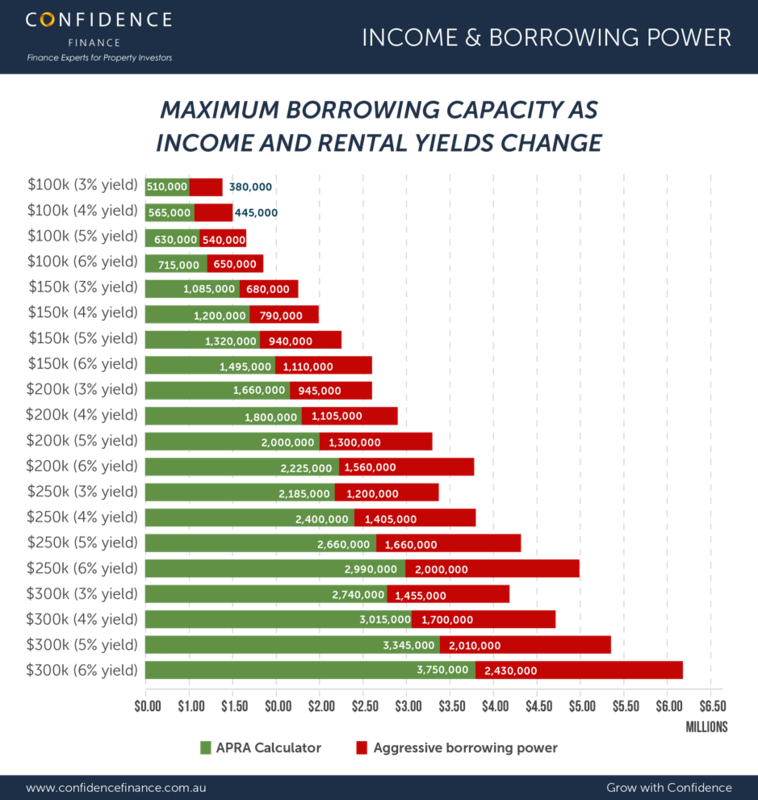 This analysis is based on a couple earning a 50/50 split of total income, renting at $400 per week with lender calculated minimum living expenses, an interest only portfolio at 4.5% that is 100% debt funded. What should I do to prepare for this? The most effective tool to managing payment shock is having liquid buffers in your portfolio to manage a potential repayment increase. Alternatively, you can simply reduce your debt levels. Knowing how your debt works. First and foremost, be very wary of strategies that involve taking on more debt to manage a debt problem. Understanding how your repayments work over time is a worthwhile exercise for property investors. Know when your interest only terms expire.This gives you a sense of where the potential risks might be in your portfolio and give you a feel for what may or may not need to be managed. Consider ways to manage the P&I repayment and a debt size you’re comfortable with. Start planning on how to bring your debt size in line with this. For example; rental increases, income additions, paying down debt, or even selling of part of the portfolio will assist. Be aware of appropriate buffer sizes that you should hold to manage your portfolio. In the immediate term, you may have non-bank lender options available to you that would allow you to maintain interest only terms on some of your loans. The cost is usually higher, but the repayment otherwise lower than P&I options. Ensure your portfolio is adequately protected (e.g. income protection insurance, life & trauma, building insurance). It could be chaos if payment shock happens at the same time as job losses. 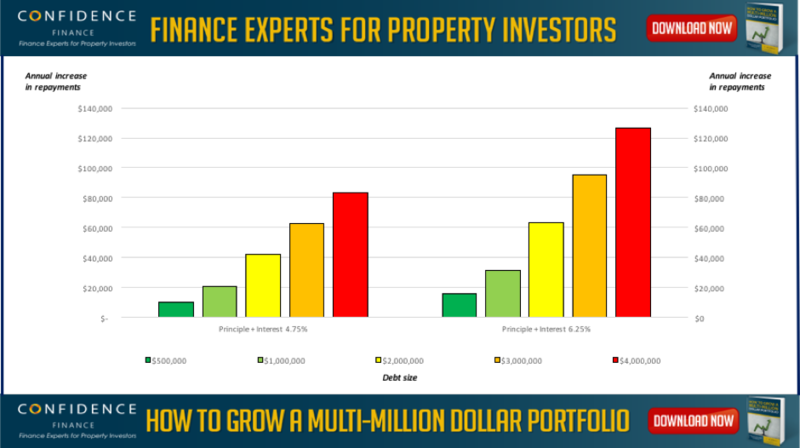 More analysis and a detailed explanation of how to manage your portfolio safely is available in our E-book: How to Grow a Multi-Million Dollar Portfolio. At Confidence Finance, we believe that long term property investing is a game of finance and property finance is a science. Understanding how each part of lending works is our specialty. We use this insight to develop a unique understanding about how lending works in Australia. We then use this expertise to help our clients grow, finance and protect successful property portfolios. Redom Syed is the CEO & Founder of Confidence Finance. In 2017, he has been recognized as one of Australia’s youngest ever to reach the Top 100 brokers in Australia. Prior to becoming a finance specialist, Redom worked as a Senior Economist at Federal Treasury, where he became a published author on the design of the International Financial System. Can I have an SMSF with a smaller super balance?